So I have been a little MIA lately, but I’m back! 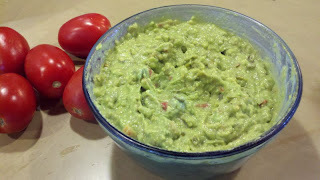 I’ll be blogging in the next few days about what all has been going on, but for today, since it is the 4th of July and I’m all ready for our party to start, I thought I’d post this guacamole recipe. It’s delicious! HD loved it (I left a little for him that didn’t have jalapeno in it)! This makes a large batch of guacamole, but it is easy to cut in half if need be! Cut the avocados in half and scrap the insides into a large bowl. Using a fork, mash the avocado. Then add the diced tomato and onion and mix well. Then add the remaining ingredients and mix well. We ate this with chips and also on our tacos. It had just the right amount of spice to it, but if you don’t want it too spicy, just put a little jalapeno in it! It was so yummy! Enjoy! « Everything is so green…..